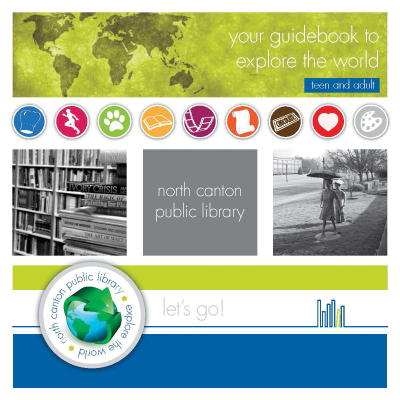 With the help of several community partnerships, the North Canton (Ohio) Public Library invited patrons to “explore the world” via our library when we launched a new brand early in 2013. The library’s board of directors had listed several goals in NCPL’s most recent strategic plan; one priority was establishing effective community relations with our 17,000 residents. The library had been without a marketing staff member for several years and had a logo but no branding. I was hired as community relations manager late in 2012, and creating a new identity was near the top of my to-do list. I come from a nonprofit background and have a mix of fundraising and marketing experience. I’d be lying if I said I’m not a fundraiser at heart. I’m not afraid to ask for donations, and I understand the shared value for the donor. Gifts in-kind are my favorite, and the easiest to secure, in my opinion. When I learned that North Canton Public Library’s strategic plan was filled with words such as “partners,” “collaborations,” and “cross-promotion,” my fundraising brain started to generate ideas. Couldn’t we create a brand that would lend itself to meeting these organizational priorities? I was working on the identity project with our graphic designer when the words “explore the world” came to us. Immediately, things began to fall in place. There were so many possibilities in the tagline: Explore the world of chocolate, Explore the world of history, Explore the world of community, Explore our collection, How may we help you explore, library card “passports,” and finally, the primary topic of this article: exploration partners and guidebooks. We know that summer reading programs are incredibly effective patron-engagement tools, and we hoped to design a program that would allow us to see some of that momentum all year long. So to support our new “explore” tagline, we created exploration guidebooks that utilize a concept similar to a summer reading program: A patron completes a task and then receives a reward for doing so. These guidebooks also gave the community a full year of repeated exposure to our new brand through continued involvement. Another reason we chose this tool was that we were in the middle of a sustainability audit (through a scholarship we were awarded from a local university), and we also wanted to begin a corporate social responsibility program. We thought the guidebooks could help us realize each of these three goals. Here’s how we made them work. We did not budget for this program. We had initially toyed with the idea of using a button with stickers or a card that would get punched for each monthly activity, but at that point we were not planning to explore the whole world. I knew going in that we would need partners in the community who would support the program in exchange for some cross-promotion. I was confident that it would come together, but I was shocked by how easily it did. We started by asking ourselves who we knew in the area. I am active in our chamber of commerce (I highly recommend this to everyone), and I do some other volunteer work, so I had a few people in mind who I thought might be willing to support the project. I was fairly confident I could get four of the themes covered and that others could come from cold calls (via email). Our designer created a sample guidebook cover and page for me to use as “selling” tools. I wrote a two-page proposal detailing the benefits for our partners, what they’d commit to providing to us, why it was a win-win for the entire community, and how their support was critical to our success. Within a couple of weeks, I had all but one partner signed on. I can honestly say that our partners were as excited as I was. The benefits we were offering were valuable: logo recognition in the NCPL newsletter (which reaches 10,000 patrons), the enewsletter (reaches 9,000), and at least 5,000 printed guidebooks, plus signage throughout the library, logo placement on our website, and visibility to the 20,000 patrons who come through our doors each month. It’s a big reach for the businesses in our community. We also invited them to participate in our logo launch party (which I detail below). So who were the partners and what did they offer? 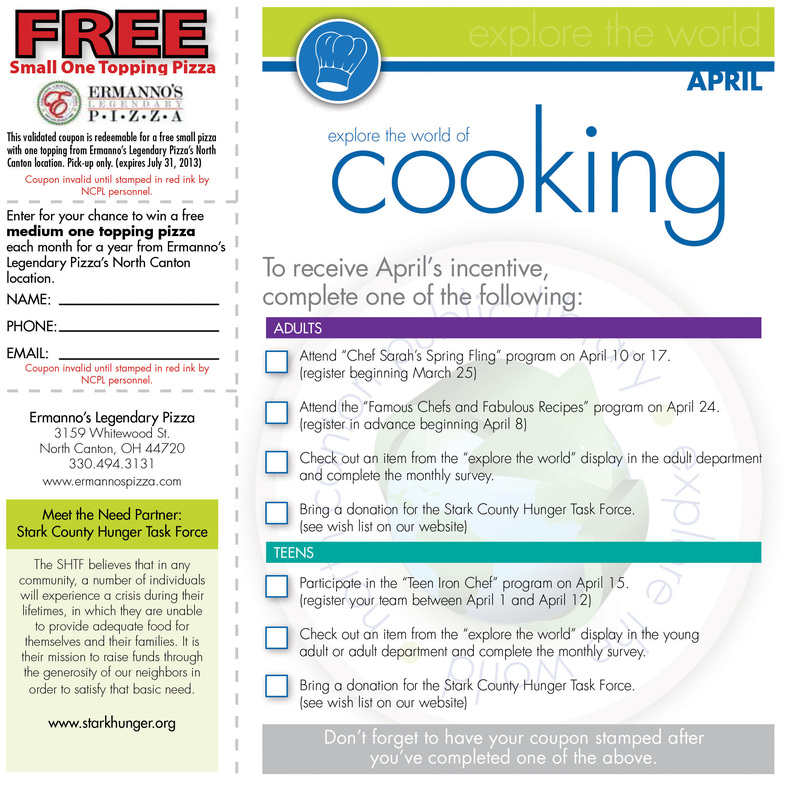 April: Ermanno’s Legendary Pizza gave a free small pizza and a chance to win a pizza each month for a year. May: The North Canton YMCA gave a free day pass and an entry to win a 3-month family membership. June: The Akron Zoo gave a free ticket to the zoo and an entry to win a season pass. July: The library offered a free bookmark and an entry to win a basket for book lovers. August: The Canton Palace Theatre gave a BOGO (buy one, get one) ticket and an entry to win a balcony party. September: The Military Aviation Preservation Society Air Museum organized an NCPL day at MAPS when those with validated guidebook coupons could visit the museum for free. October: Hometown Chocolates offered free chocolate lollipops and an entry to win a chocolate lover’s gift basket. November: The Foundation for Community Betterment offered lemonade stand starter kits and an entry to win $100 donated to the local charity of a patron’s choice. December: The Friends of the Little Art Gallery offered an item from the “artist’s toolkit” and an entry to win an art lover’s basket. We planned a party to launch our new logo and promoted it for months in advance. NCPL’s 2012 holiday card included a request for recipients to save the date in March 2013. To build interest, we created a Facebook event for it. Additionally, local newspapers picked up the story, and we placed a half-page ad in our local weekly paper the day of the party. Our “exploration partners” were all promoting the event as well. The logo launch party, which we held on a Saturday in March, attracted 1,111 patrons. The event centered around the unveiling of our new brand image and all affiliated materials such as signage and logo wear. Our exploration partners each hosted a table where they offered coupons, samples, and literature. Reaching more than 1,000 potential customers in a day was certainly a perk for the partners. We gave out guidebooks for the first time at the party as well. As I mentioned earlier, we were already doing a sustainability audit, and we wanted to begin a corporate social responsibility (CSR) program. CSR means doing work that creates value inside and outside of a company by aligning business goals with social and environmental needs. Here at NCPL, we decided to develop programs to motivate change in our community and beyond. To incorporate our CSR and other sustainability efforts into the guidebook program, we collected in-kind donations for a different nonprofit each month, validating patrons’ guidebooks if they brought a donation. Since the library had done successful year-end donation drives in the past, we wanted to incorporate more drives, which we spread out throughout the year and tied in to our guidebook program. The partnerships we’ve built from that program, which we call “Meet the Need,” have been invaluable. Attendance at the programs listed in the guidebooks was, in most cases, above average. (However, film month was a flop. Lesson learned.) What’s more, families who had not previously visited the library and did not have library cards came in because they heard about the free zoo ticket or the free pizza coupon, etc. Now the community knows about us. People talk about us and what we’re doing. Organizations and businesses call and ask us about partnerships. We’ve made a commitment to not saying “no” unless we truly cannot say “yes,” because we realize how important these relationships are. We’ve borrowed tables from the YMCA (May’s partner) for an event, and it has borrowed our inflatable movie screen. We completed a fantastic doghouse-building program with the help of one of our Meet the Need partners, in which that organization helped our teens build and paint doghouses to be donated to the local Humane Society. We hosted a Community Involvement Fair where many of our guidebook and Meet the Need partners hosted tables. We’ve gained some statewide and national attention because of the program too. Our patrons are happy. Our partners are happy. We are happy. Our guidebook program wasn’t perfect, and we’re making some changes for 2014. We found that the incentive has to be a freebie, not a discount coupon or BOGO coupon. We’ll streamline our “explore the world” programming. Having one program from each department is plenty. More than that causes confusion for staff and patrons alike. We’ll issue a memo to all staff members each month detailing who the partner is, what we’re offering, what patrons need to do to earn the incentive, and how staff can help us “sell” the program. We will have only four (quarterly) Meet the Need partners. Collecting for only 1 month was confusing for patrons, too much work for staff, and brought in too few donations. Looking back, our guidebook project wasn’t perfect, but I have very few regrets about the rollout of the new identity, and I’m happy with the partnerships and recognition we’ve built. The new logo and associated tagline are quickly becoming synonymous with the library, which says “success” to me. Christina Weyrick-Cooper is the community relations manager for the North Canton Public Library in Ohio. She has a degree in communication from the University of Akron in Ohio. Her email address is ccooper@northcantonlibrary.org.